AvailabilityItems ship from multiple locations and may arrive at different times. Usually leaves the warehouse on the next business day. INCLUDED: Alphasew P60876 Universal Cap Hoopster Fits Hoops from 5-1/4"x6-1/4"
*FREE 1GB USB Memory Stick Flash Thumb Drive to store or download designs & upgrades from computer to embroidery or quilting machine USB-A Ports. Brother Dream Machine and PE770 Embroidery Only and Simplicity Score Consumer Digest Best Buy Awards. 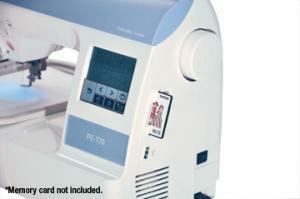 *Brother PE770 is a Recommended Best Buy Computer Embroidery Machine in Consumer Digest Magazine! Expand to 12x5" hooping with SA445 Extra Large Embroidery Hoop & Grid multi-position embroidery frame. Also SA443 4x4", SA442 2x1" and Extra SA444 5x7" Standard. 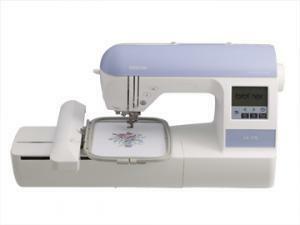 The PE-770 is the latest computerized embroidery machine that is compatible with USB Memory Sticks! Import designs up to a maximum of 5” x 7”. Utilize the Brother Memory Card Library for even more designs. Now you can embellish everything from home décor to T-shirts with one of 136 built-in embroidery patterns which include delicate scroll work, intricate florals, classic quilt patterns and so much more. 136 built-in embroidery designs and 6 embroidery alphanumeric fonts. Add a finishing touch with the 10 built-in frame shapes and 12 border styles. Save designs for future use. Maximum embroidery field of 5" x 7". Expand to 12" x 5" with optional multi-position embroidery frame. 4x4" and 2" frames also available. 1.6" x 3" backlit monochrome touch screen LCD. Included Embroidery Hoops 5" x 7"
LCD Touch Control Panel 1.6"x3"
Maximum Embroidery Field 5" x 7"
Embroidery hoop arm can be left on the machine! Brother most popular .pes Card Port in addition to USB-A Memory Stick Compatible USB port below it. Brother one hand needle threading mechanism, without your having to hold the thread. 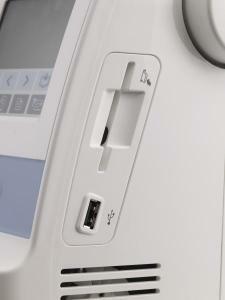 The Brother PE770 machine has a slight capability to change size of some of the designs. Keep in mind it does not change the stitch count. If the design is not encrypted it will accept size changes. The photo below will hopefully help----Follow the steps in order of 1-3 and then adjust the size larger or smaller. Re: buy a machine with an aluminum frame versus, I guess, plastic; With regard to the PE770, does this machine have an aluminum frame? Phyllis, yes the Brother PE770 has a solid aluminum metal casting for holding top and bottom shafts and linkages. 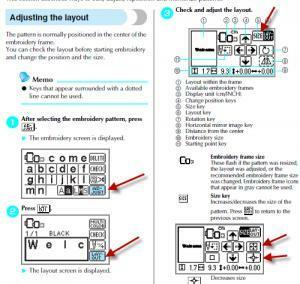 If fact, all the Brother dealer model machines including PE770 and PE780 embroidery only machines have this feature. It is only the low end mass merchant machines that that have plastic front and back covers for holding top and bottom shafts and linkages in place. Vibration is not as much of a problem with embroidery only machines with fixed center needle positions (no zigzag mechanisms inside) and no feed dog mechanisms underneath.. All Brother machines are smooth running with less vibration and decibel ratings than other major brands of the same type. . Brother PE700 series embroidery machines may need to be run in after lubrication to loosen them up. 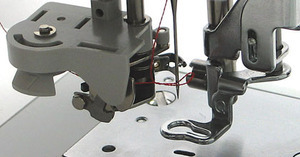 Mechanical binds can occur in needle bar or take up lever assemblies. Remove the face plate (light cover) on the left of the upper arm. Put a drop of oil on the top and bottom of the needle bar shaft so it reaches the top and bottom of the needle bar frame support that holds the needle in place while it goes up and down. Also put a drop of oil on the metal to metal moving parts of the take up lever assembly (you can remove the 3x3" plastic tension cover under the lid on top with one phillips screw to see better). Rock the hand wheel back and forth until you get 360 degree movement. If the machine is still hot from running or binding, you must wait until it cools off before turning the handwheel. Lubrication and hand wheel rotation may solve initial binding problems. If binds persist, remove the embroidery arm and go into the service mode to run the machine at full speed without thread, needle, bobbin case, or embroidery unit. Push in the Start/Stop and Needle Up/Down buttons with two fingers at the same time while turning the machine on. Hold down the buttons until the numbered box service screen panel comes up. Select program #14 Speed. Push the start/stop button which will run the machine at full speed to work the oil into the needle bar frame support and take up lever assemblies.. Let it run as long as needed to increase the speed and motor rpm to maximum (you can hear the pitch of the motor increasing in tone until it levels off at 800 stitches per minute). Then put the embroidery arm back on, thread up and sew. I am a previous customer, back in Oct 2000, when I purchased a Brother PC3000 sewing machine from allbrands. com and never regretted the decision. In fact, it was a refurbished model and I am still using today. Now I am looking for an embroidery only machine to add to my collection. I have been researching the PE770 and am drawn to it for all that if offers for the price, but in talking with dealers, they recommend that I whatever I buy, that I buy a machine with an aluminum frame versus, I guess, plastic; to buy a machine that has some weight to it, because of the vibration that occurs with embroidery machines. Question: With regard to the PE770, does this machine have an aluminum frame? The Brother PE770 has a solid aluminum metal casting for holding top and bottom shafts and linkages. 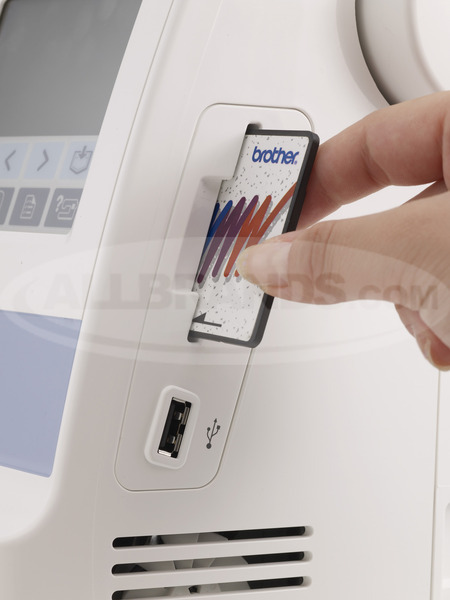 If fact, all the Brother dealer model machines including PE770 and PE780 embroidery only machines have this feature. It is only the low end mass merchant machines that that have plastic front and back covers for holding top and bottom shafts and linkages in place. Vibration is not as much of a problem with embroidery only machines with fixed center needle positions (no zigzag mechanisms inside) and no feed dog mechanisms underneath.. All Brother machines are smooth running with less vibration and decibel ratings than other major brands of the same type. I wanted an embroidery machine that was easier to transport to my embroidery club meetings. 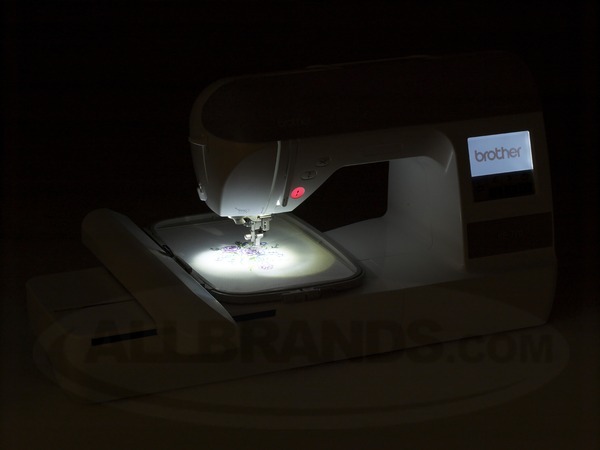 I ordered the Brother PE770 embroidery machine from Allbrands. It arrived in 3 days and the box contained everything as advertised. I tried several embroidery designs, both built-in and from a flash drive. It is performing very well and is a great addition to my "toys". I am very pleased with it and the company's service. Employees were very friendly and plesant to deal with. I was very satisfied with the product I ordered. I was shocked I received the product the next day!!! I will order for ALLBRANDS again! I love Allbrands. This is my fourth machine from Allbrands. You have great customer service. 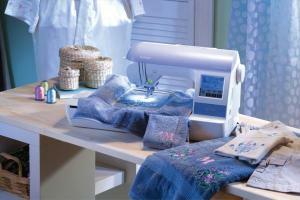 I am a sewing instructor and I tell all my students to go to Allbrands.com to purchase their machines. I am and will continue to be a happy customer of Allbrands.